The drive test solution from Rohde & Schwarz features convenient data export to visualize your radio network performance in Google Earth. The performance of a cellular network is a key factor, particularly for network operators and infrastructure manufacturers. Performance measurements are usually carried out with drive test solutions consisting of a measurement receiver, drive test software and integrated mobile terminals, which support the applicable cellular standards. Results are evaluated and displayed with the drive test software. Network optimization engineers and experts are familiar with such software and can easily interpret the results. 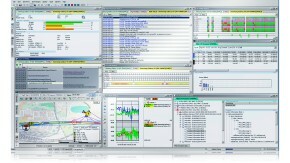 However, drive test software is not always available on every external computer where the results need to be visualized. In this case, or when the results need to be presented to a broader, or non-technical audience, data preparation can involve a lot of work and hassle. Rohde & Schwarz makes network performance data available on any computer and – moreover – evident for everyone. The R&S®TSMW network analyzer, in combination with the R&S®ROMES drive test software, features data export of the measured results to clearly visualize your network performance in Google Earth. Google Earth is a well-established software tool that maps the earth by superimposing images obtained from satellites or aerial photography. Color gradients and pillars are used to integrate the performance results into this photographic map precisely at the position the measurement was taken. The overall performance becomes visible and obvious at first glance. Export of the measuring data is simple. 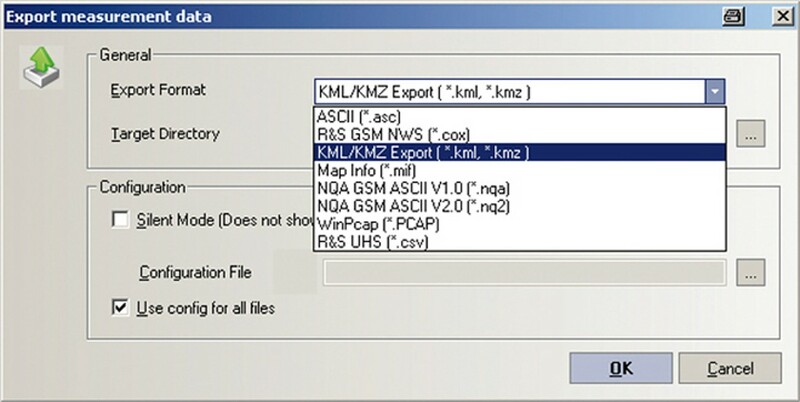 The export dialog of R&S®ROMES is used to transfer the data of interest into the keyhole markup language format – both in compressed (KMZ) and uncompressed file format (KML) – applicable for Google Earth. R&S®ROMES provides all performance results measured with the R&S®TSMW and the integrated mobile terminal in a clearly arranged list. You only need to select the performance results you want to be visualized in Google Earth. 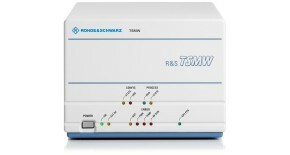 The R&S®TSMW network analyzer supports all frequency bands and major cellular standards, such as LTE, WiMAX™, WCDMA/HSPA and GSM/EDGE, in one box, and is operated via the flexible and versatile R&S®ROMES drive test software. 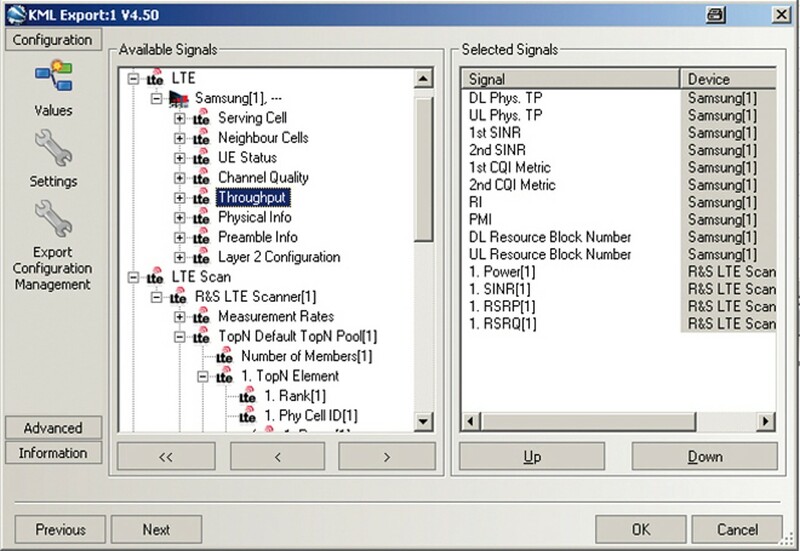 Adding, for example, the Samsung LTE USB modem enables reliable measurements of an LTE network. Typical measurements include downlink and uplink throughput analysis, which is compared with the received signal quality, the reported channel quality (channel quality indicator, CQI) and the rank indicator (RI). The CQI value has an impact on the modulation and coding scheme (MCS) selected by the base station. The translation from measured received signal quality to reported CQI value is vendor-specific. The RI value indicates the base station if, for example, the channel conditions are good enough to enable 2×2 MIMO – or spatial multiplexing – so that the mobile terminal can be scheduled accordingly to achieve higher throughput. All these values and measured parameters can be exported from R&S®ROMES for a pictorial representation in Google Earth to make network performance visible to everyone.